Griffblog | The diary of a 40+ something technology writer, gadget geek and computing nerd! » Blog Archive » Fleet Half Marathon – I did it! Fleet Half Marathon – I did it! Well I’m no longer a half-marathon virgin. Yesterday I ran the Fleet Half Marathon in 2hrs 33mins. And boy was it tough! With the weather forecast for the weekend looking ominous I spent Saturday nervously preparing my running kit, ensuring I ate all the right food and trying to think of the finish line. After a fitful night’s sleep I awoke, force down a bowl of porridge and headed to the race start. The weather couldn’t have been worse, torrential rain, very cold and the field in which the event start/finish had been set-up was a mud bath. First lesson learnt, wear tracksuit bottoms! I arrived an hour early as advised and was shivering by the time the race form up was called. The time came to strip off my fleece and walk to the start. By the time the gun fired we were already soaked through and the chance to get moving was a welcome one! The first part of the course was a loop which takes in Fleet High street twice. The crowds of people who had come out to cheer us all on despite the weather was much appreciated. At Mile 2 I passed my wife and daughter which gave me another little boost. After the town centre it was over the M3 and out into the country. Fewer supporters but plenty of race marshals who were full of encouragement and smiles. 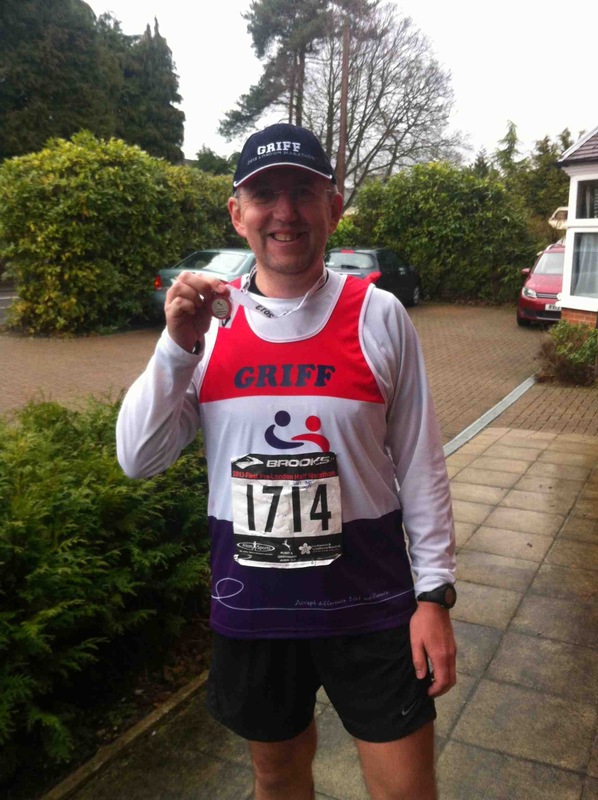 I lost count of how many times I heard “c’mon Griff'” thanks to my name plastered across the Charity race vest. At mile 6 I gave in to the call of nature and stopped at some portaloos. Nerves clearly in evidence as I’d been half a dozen times before leaving home and once 10mins before the start! Feeling much better I pushed on, by now well and truly soaked, my feet were squelching with each step and the rain, which had soaked my baseball cap, was now streaming off the brim. At Mile 9 I was flagging. I felt like all my energy had been drained, worrying since I’d done 12 miles the week before and not felt this bad. Decided to use the one gel I’d brought, washed down with a cup of water from the water stop. More cheers and support so I pressed on although I never did feel any benefit from that gel? Turning into the last main stretch and passed Mile 12. Everything hurting now, calf muscles were burning, running pace more of a crawl now, pretty sure I could speed walk faster! With 300m to go my wife appeared, perfect timing! (I’d used the Glympse app on my iPhone to broadcast my location and so she knew exactly when I’d reach her.). I managed to turn into the finishing straight and walked the 20yards across a mud bath before jogging down the finish funnel. Got my medal, a bottle of water and a bag of Haribos, lovely! Couldn’t wait to reclaim my kit bag and put on the fleece, I was freezing by now. So, felt brilliant to have done it, but now starting to panic as to how I’m going to cope on the London Marathon, hopefully it will be warmer and dryer, I think the cold and being soaked had a massive effect on my energy stores, but I still have a lot of work to do in the next five weeks.